TechnoServe is connecting cocoa farmers in Honduras with a gourmet chocolate maker in the United States — and helping to rebuild the country’s cocoa industry. Fermin Arriaga proudly displays a gourmet dark chocolate bar from Askinosie Chocolate bearing his image. Fermin is the lead farmer at Finca Patricia, a producer group in Cortés, Honduras, that has been working with TechnoServe to improve the quality of their cocoa beans and access a specialty market. TechnoServe helped Finca Patricia identify elite native varieties and facilitated a connection to Askinosie, a gourmet chocolate maker based in Springfield, Missouri. The two businesses have since developed a stable and sustainable relationship. Fermin and his fellow farmers at Finca Patricia are benefiting from higher incomes and more secure livelihoods. The Honduras chocolate bar, meanwhile, has won an award and become one of Askinosie Chocolate’s most popular. 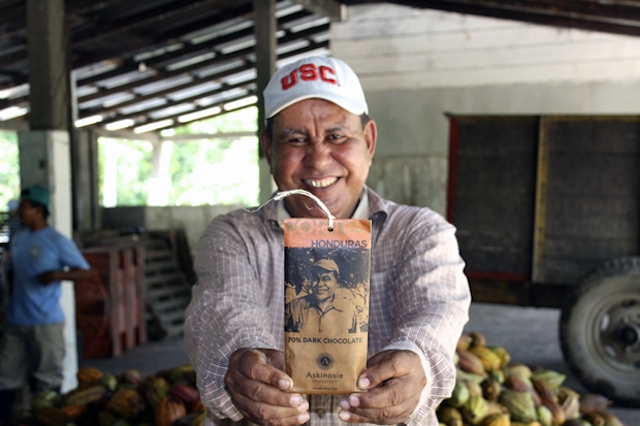 Learn more about how TechnoServe has helped rebuild the cocoa industry in Honduras.